Church of Saint George, Lalibela Ethiopia. Negotiation is underway between the Ministry of Culture and Tourism and United Nations Education Science and Culture Organization (UNESCO) to find lasting solution to the threats facing the Lalilbel's monolithic Rock-Hewn Churches. Years ago, a metal roof was erected as temporary solution to protect possible cracks and damages caused by sun slights. But the shelter has not been removed for several years. 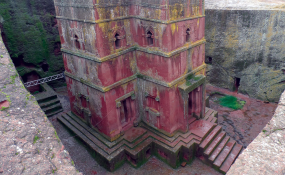 Some residents fear that the protective shield could be damaging to the churches, Getu Asefa, UNESCO Cultural Program Officer told The Ethiopian Herald. Negotiation is ongoing between the ministry and UNESCO to put in place other mechanisms that were proved effective in other churches such as Bete Geberael and Bete Rufael. The metal shelters were meant to shield the churches from winds and sun light and should have been removed earlier as possible collapses may damage the churches. Accordingly the ministry and UNESCO are working to find lasting solution to conserve the marvelous world heritage. Study has been finalized to select proper mechanisms to rehabilitate and conserve the churches. Engineering finance has been prepared and there will be announcement of bidding very soon to start work on rehabilitation. Hence, UNESCO would provide technical assistance and may help the country solicit financial resources. generating 300 MW wind power. The ministry also commences negotiation and bidding process to generate power from sun light. The projects include Metahera (Central Ethiopia), Mekelle (Northern Ethiopia), Dichoto (North Eastern Ethiopia) and Gad (Eastern Ethiopia). While some 7.2 MW is produced currently from geothermal, yet it is very low compared to the potential. "A final agreement is reached to produce 1000 MW at Corbetti and Tulu Mojo projects, each producing 500 MW." Wind energy taken to be a major energy source, says Bizuneh:"The ministry has planned to set up two wind farms. The first farm, 'Aisha II' is under construction. The financial difficulty to commence the construction of the second project 'Asela' was resolved as agreement was reached with the government of Denmark to finance it. Unprecedented in the past, the ministry has also opened the door for the private sector to invest and engage in the production of energy while the government still controls the distribution, as to Bizuneh. Recently, Ethiopia has launched the very ambitious project of national electrification program to make electricity accessible in all parts of the country.